Is a cultural event that enables Canadians to enjoy and learn about different cultures from different parts of African descent in B.C Vancouver through music, Arts, Values, Customs, History, Heritage etc. To build a society enriched and interconnected through African descent Canadian arts, history and culture with a mandate to build a center for African Heritage Cultural Centre at Hogan’s Alley. 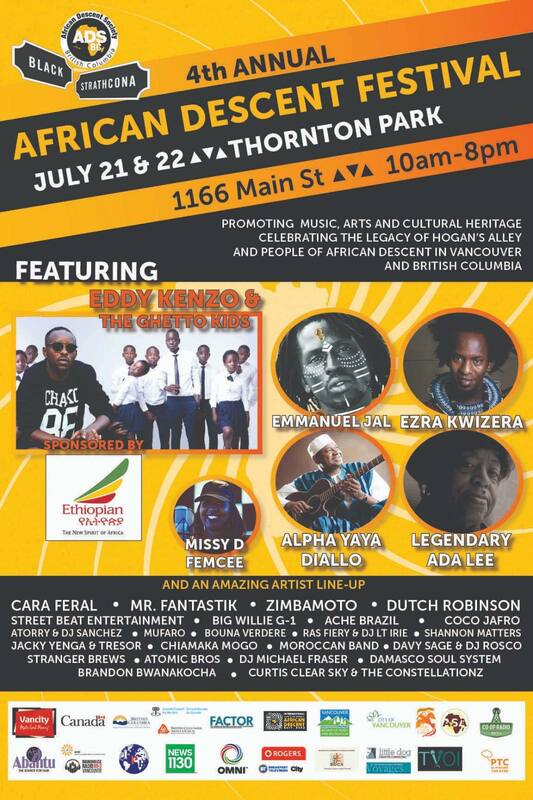 African Descent Society is hosting 4th annual African descent Festival on July 21 to 22nd 2018 from 10am to 8pm at 1166 Thornton park Main Street Vancouver B.C. The event will feature the Ugandan superstar Eddy Kenzo a long side the best dance group# Ghetto Kids. The event will also feature with many great artists such as Emmanuel Jar, Ezra Kwizera, Alpha Yaya Diallo, Legendary Ada Lee and many more great artist. Don’t Miss Out! #Free event# Free Admission# Fashion# Food# Music# Dancing# Vancouver# Culture# Arts# History# British Columbia.